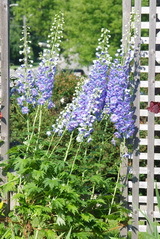 Dallying In The Dirt, Issue #131 --- Great spires of dazzling Delphiniums punctuate the garden. The Delphiniums give some graceful and colourful height to the perennial garden as summer starts. I have a wonderful collection of them that fill the gaps between the trellises. They are D. Elatum hybrids that I started from seed, which is easy to do with Delphiniums. The seed came from Dowdeswell’s a great breeder in New Zealand, who will happily ship it anywhere. It was a mix of colours that gave me several shades of blue and a deep rose coloured one. The picture was taken this week and I seeded those Delphiniums in the winter of 2011. Parsnips are not everyone’s favourite vegetable but they grace our plates as often as possible. I like to roast them around a chicken or put them in a stew. They are a long season crop and a bit tricky to start. They are one of a few vegetables that insist on having fresh seed. I never try to keep it from year to year. The tricky part is getting them to germinate. They are not difficult, they just take a long time and you can lose track of where you planted them. 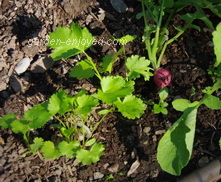 I plant a few Radish seeds along the row of Parsnips as the Radish come up quickly. When the Radish are ready to harvest you will see the little Parsnip seedlings emerging in their shadow. The Parsnips themselves will be ready to harvest in the later autumn. They are one of those vegetables that taste much sweeter and better after they have had a light touch of frost. Bill Davis was a dear old friend of ours and he reappears in our garden with great fanfare. 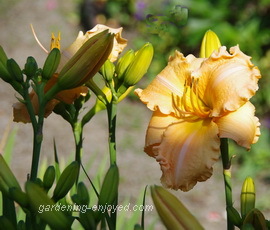 He had a wonderful deep apricot Daylily named for him and William E Davis is always the first Daylily to open in our garden. He showed up yesterday right at the foot of our front stairs to herald the beginning of that season. There are at least 30 different Daylilies scattered throughout the many beds and they should keep us surrounded by blooms of every colour until nearly the end of August. When is somebody going to add blue to their palette? I must confess to liking my Iris better but Daylilies have much to recommend them. They bloom for a long period of the summer, they don’t have to be dug and divided very often and they have virtually no insect or disease problems. They are a lazy gardeners best perennial friend. Yasmeen Asks ? Thanks so much for the informative news letters. I look orward to reading them. Since you mentioned success with cymbidium, let me tell you of my failure - twice. I had one plant and was advised to pot it in a large container, to let it get some frost and then bring indoors. The first time the frost made it mushy and I lost it, this year it was struggling indoors and then just bit the dust. What did I do wrong? Ken Answers! It's a bit of a delicate balance between letting it have a cool period and having it outside when there is enough frost to damage it. Mine usually make it outside until the end of October and then find their way indoors where they live in a room with lots of daylight to help them into bloom. Loretta Asks? My question is about hibiscus. I have one as a tree in a pot. Lovely yellow blooms but also many yellow leaves. Is there something I should be doing besides watering? Ken Answers! Hibiscus, like all trees, doesn't keep their leaves forever. If you are losing a few of the oldest leaves then that is natural. If you are losing many, then maybe it needs some fertilizer as well as the water. Mine is outside, for the summer, and gets fertilizer in its water about every two weeks. They do like a lot of light, mine is in full sun for several hours each day. Ellen Asks? Is there any way to eradicate Trumpet Vine, other than maybe burying it in a foot of concrete? :) I've tried the pickling salt/pickling vinegar/dish soap spray, mulching over it with a layer of wet cardboard and cedar mulch and it's even come up through 12" high raised vegetable beds! Help?! Ken Answers! The people buying it at the nurseries this weekend will ask if it is hardy enough to survive :-) You can do a massive dig trying to get all of the root out of the ground but don't leave some small bits. Continuing to cut down any shoots that you see will eventually kill it as it must have some sunlight to continue growing. It has lovely orange flowers, you could try to reconcile your relationship and learn to love it again.